The UUSGS Green Team was formed in the Fall of 2013 and meets regularly with the aim of sharing environmental information with the congregation, developing action plans to address climate issues, and working collaboratively with other state and local organizations to enhance the livability and enjoyment of our Earth. We are a group that cares deeply about environmental issues. Our concerns include climate justice and building a sustainable world. New members are very welcome. For more information please contact Joan Butler (413-566-5035) or joanbutler@charter.net, or any Green Team member. The UUSGS Green Team is excited to partner with Trinity Solar, a reputable solar consulting and installation company. The Green Team evaluated several local providers and recommends Trinity based upon their shared values and their ability to work with a variety of financing and installation needs. To sign up for a free, low-pressure consultation with Trinity, click the Trinity logo below. Achieved status as a Climate Action Team (CAT) through the Unitarian Universalist United Nations Office. Earth Day fairs held in April; informational tables in Friendship Hall throughout the year. Green Team members’ assistance leading Sunday services dealing with the environment and climate justice. A Bounty Table in late summer providing fresh fruits and vegetables shared from our gardens. Donations go to Open Pantry. Environmental films and workshops offered to the congregation our wider community. Active partnerships with: The Interfaith Climate Coalition, the Longmeadow Transition Team, local congregations, Climate Action Now, Arise for Social Justice and Divest Our Pensions Now. Co-sponsored a series of actions and events centering on Pope Francis’ address to a joint session of Congress in September 2015 and the international climate Summit in Paris (COP21) in December 2015. Arranged buses to transport UUs and others to New York City for the People’s Climate March in September 2014. 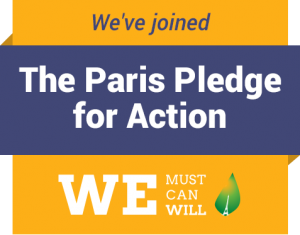 Co-signer of The Paris Pledge for Action.